I’m very proud to be conducting the Cherry Blossom Musical Arts orchestra in the world premiere of Paul’s Concerto for Electric Guitar and Chamber Orchestra as well as the Oregon premiere of my arrangement of Duke Ellington’s Single Petal of a Rose. I did a brief interview with Paul about his new work that you can read below. This project, culminating in a concert on Feb 10, is a monumental undertaking, for which preparation has been going on for many months. If you are in the Eugene area, you must be there! 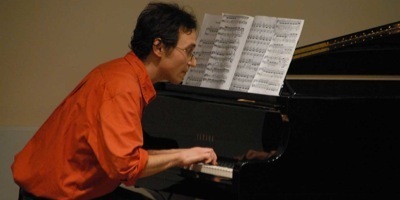 "Art Music Live in the 21st Century II"
-Fly On: Variations on a theme by Jimi Hendrix for solo piano written and performed by Eugene composer Paul Safar. The Concerto for Electric Guitar and Chamber Orchestra was written by Cherry Blossom Resident Composer Paul Safar for the popular Eugene guitarist Olem Alves. Alves will be playing with an orchestra assembled from the Eugene Symphony, the Oregon Mozart Players and the University of Oregon School of Music and Dance, conducted by Douglas Detrick. DD: Your concerto includes a really broad range of stylistic influences. You've mixed old and new styles, an electric guitar with acoustic accompaniment and written lush, beautiful melodies along with more abstract, improvised sections. Also, genres of music not conventionally associated with the orchestra, among them rock, jazz and afro-cuban music, are very important to the piece. How do all these different styles come together into one piece for you? PS: Most importantly, I am hoping that the rather tight structure of the piece holds it together. This piece to me is above all very classical in its form. I grew up with classical piano early on and one of the first big pieces I sunk my teeth into was Beethoven's Pathetique Piano Sonata. In this rather daunting undertaking of tackling a big project like this concerto, I decided it wise to base the first movement structurally on a piece I knew well, that particular sonata. Musically I have always been a bit of jack of all trades. I do feel equally at home in classical, jazz and pop/rock having played all those genres since a young age. Perhaps this eclectic background can be a blessing in disguise in creating some musical coherence. I'm hoping I have assimilated those diverse influences into something whole, perhaps a different take on a "classical" piece. The initial impetus for writing the piece is a feeling that this wonderful instrument, the electric guitar, seemed to be underrepresented in the classical music world. It is an instrument of my generation, of power, a variety of timbres, with a long sustain like a wind or string instrument and the ability to bend notes like the voice. It's an expressive instrument. I've included some short structured improvisation sections both since the history of the instrument if filled with it and as a nod to Olem, whose forte is improvisation. Yes, this piece is, in a way, Hendrix meets Brahms (maybe odd bedfellows) but I am happy combining equally the classical and vernacular as they are both deeply engrained in me. DD: This is a monumental project. You've not only written the piece, but organized an entire orchestra, written grants to help with funding, and dealt with all the difficulties that come with producing a concert. Its a testament to your hard work, and also to the vibrancy of the Eugene music community. Could you talk about the creation of the piece and the production of the concert? How was a project like this possible? well), Nancy has a great artistic vision and is great at makeing important personal connections. I also always trust her artistic judgements when I'm grappling with big picture compositional questions. In addition she has been invaluable in the more practical process with p.r and fund raising. She is Cherry Blossom's grant writer. For her I am hugely grateful. We are a small non profit but always seem to manage to break even from project to project. Another big component to making this actually happen is in its timing. I had the idea to write a concerto for electric guitar over 15 years ago but the time really wasn't right in hindsight. I needed to both mature as a composer and let my sojourn into pop music lead me back into "art music" via Nancy and Cherry Blossom. I also now have colleagues to bounce ideas off of. I met the right collaborators as precisely the right time me to feel like this could really come about. Having Olem Alves to write the piece for and work with is huge. In addition, meeting you, Doug, and having you help me with some skills I was lacking in has been just great. Both of you are very professional and easy to get along with (a nice combination). Having been a part of the Eugene music scene for 16 years now as both piano teacher and performer, I have been lucky to befriend great players to ask to be a part of this concert. Maybe I also needed to get over the age of forty and realize that this has been a long term dream that needed to happen sooner than later! DD: The piece is dedicated to your father, Peter Safar. How does the piece honor his memory? Has your relationship to the music developed through the course of its creation? How? PS: My father, Peter Safar, who passed away in 2003, was a big influence on me. In addition to a huge heart, a big drive, determination and work ethic, he also instilled in me the love of music as something that can be transcendent. Although steeped in western classical music, especially the germanic tradition, my dad was, at his core, pretty darn open-minded in terms of music. He was always very supportive of my music whatever the style. Since I feel this is my most ambitious work to date and one that nods strongly to his musical traditions, it makes sense to dedicate it to his memory. One of his favorite composers was Mahler and although this piece is much more abstract in nature than that Romantic Viennese composer, I do view the piece overall as a journey, a story which contains both a diary for me and hopefully a resonance with with the audience. I am very excited to hear this birthing of a piece that’s dear to my heart and some time in the making. I hope the piece creates a colorful sound palette with its blend of the electric soloist and orchestral musicians. And I hope it comes across as vibrant, exciting, and both challenging as well as familiar.